Enjoy of a reliable service in Wick that has gained over 95% of positive feedback! A: We can promptly remove smudges with either outside window cleaning (for four-storey properties), rope access window washing (for high-rise properties), or via the usual manual cleaning of interior casements. A: Certainly! This equipment can extend up to 22 metres in length, allowing the experts to painlessly reach and scrub even the farthest corners of your panes. A: Our water is distilled from any residue-causing impurities. When this water evaporates under the sun, it won't leave any streaks behind. A: Rainwater is usually unpolluted, so it won't halt us from doing our job. However, while we won't mind a slight drizzle, a sudden cloudburst can result in unsatisfying results. During thunderstorms, we may have to postpone our service for a day of your preference to ensure the technicians' safety. A: No, the practiced window cleaners in Wick can easily perform exterior window cleaning in your absence, as long as your property gates are unbarred. And if you want your windows to shine on the inside, just book our complimentary key pick-up and delivery alternative instead. When you opt for a window cleaning Wick session, you'll be able to renew the casements of any property at reasonable fees that remain changed by minimum contracts or undisclosed payments. See if you agree with our statement – check our useful price table below. According to your needs, our window cleaning Wick can provide you with three choices. If you opt for outside cleaning, the experts will make use of a special water-fed pole. This cleaning tool can extend up to 22 metres in length, which is equivalent to the height of a four-storey property. The Wick window cleaners will use distilled water under high pressure that will blast away all stains in little to no time. If you run a lofty property instead, then have a loot at our rope access window cleaning. There, a team of approved climbers will painstakingly clean your windows until they witness the image of the setting sun. For your ease of mind, we check the washing equipment on a day-to-day basis and can offer COSHH records at your request. For in-house cleaning, the professionals will use ladders and squeegees to ensure that even the highest places will get proper treatment. As we obtained more and more positive reviews from our clients, the demand for window cleaning in Wick has noticeably skyrocketed in close by areas. You can find the locations we've included in the list below. 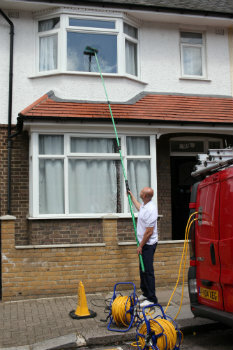 For those of you who'd rather book window cleaning services Wick E9 online, fill in our get a free instant quote form.